4-Year Freeze Means Pelham Rates 20% Lower! Region’s 8.5% waste water increase. How are we able to freeze rates for the fourth year in a row? And, how do we compare to others in Niagara? Prior to 2010 the Town measured water usage and calculated waste water charges with old gallon and cubic meter odometer-type wheel meters – many from the 1960s and 1970s. Many of the aged-meters counted slowly or were failing/broken. It took two weeks to collect readings. If a system leaked, it could take months to detect. In 2010, the Town worked with Neptune Technology to replace and upgrade all 4,200 our meters to electronic, RF (Radio Frequency) meters. In addition to leak, backflow, and tamper detection, it only takes 3-4 hours for staff to collect usage data every two months. Not only does this cost less and give much more accurate billing, but we also automatically notify residents / businesses by phone if there is a leak or other issue with their water service. And, after replacing all the meters, we reduced our water loss from +20% to less than 10%! As you know, we have also upgraded significant Town infrastructure over the last number of years. As we reconstructed or improved roads like Haist Street, Pelham Street, and Canboro Road we also replaced old water and sewer pipes. Over the last nine years, we replaced more than 14 kilometers of cast iron water mains, which helped stop costly leaks and reduces the number of breaks and repairs. 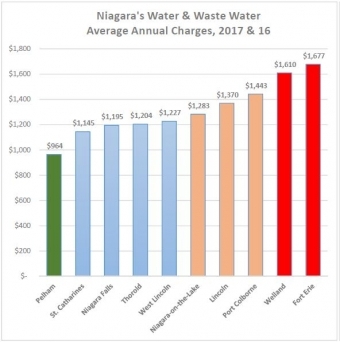 I reviewed the most up-to-date rates and calculated the fixed charges and the rates for both water and waste water for Pelham and for the other local municipalities. At $161 for two months (for the average residential use of 50 cubic metres) Pelham leads the pack with the lowest combined water and waste water charges! Four of our neighbours – Niagara Falls, St. Catharines, Thorold, and West Lincoln – are between 19% and 27% more expensive. The others – Fort Erie, Lincoln, Niagara-on-the-Lake, Port Colborne, and Welland –are 33% to 79% more expensive! Council and I are pleased that our investments in innovation and infrastructure save you hundreds of dollars each year and allow us to freeze water and sewer rates for a fourth consecutive year! You may contact Mayor Dave at mayordave@pelham.ca or see comparison charts at www.pelhammayordave.blogspot.ca .